This is a pair of Hyrax 1.9" Rock Crawling Tires in the all-new Predator Compound. The future of 1.9" Tire Performance has arrived with Pro-Line's Hyrax Tire! Designed from the ground up for maximum grip on the toughest terrain, the Hyrax tire is ready for anything your Scale Adventure might throw at you. 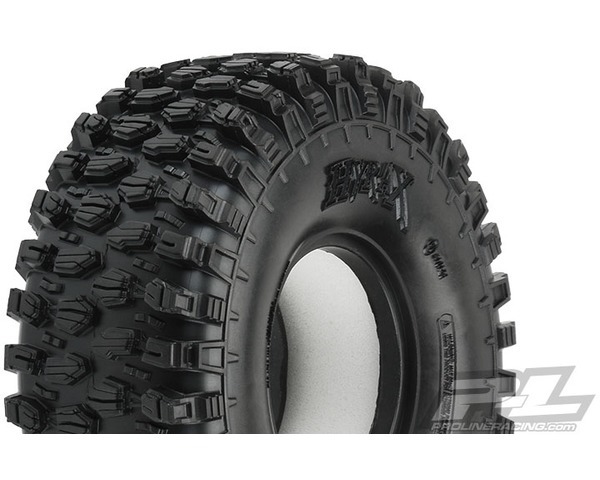 The Hyrax is now available in the softest Rock Crawling Rubber ever made: The all-new Predator Compound! The Super Soft Predator Compound excels on wet or ultra-low traction surfaces to give you grip like you have never experienced before. The Hyrax tire features an aggressive and open tread pattern with each tread block containing multiple Sipes for incredible tread flex. The highly detailed connected tread on the sidewall of the Hyrax extends out for unmatched side-hilling performance. The Hyrax also features futuristic stepped tread blocks that create even more forward gripping edges that dig into slick rock like no other scale tire Pro-Line has produced to date!